Imagine enjoying Saturday morning breakfast on your screened-in patio — or entertaining friends on your secluded backyard deck. Whether you dream about a gorgeous patio, a stunning deck, or a showpiece porch, outdoor living is a luxury everyone should experience in their own homes. While outdoor living has never been more popular, there’s a big misconception that only the very rich can enjoy a jaw-dropping outdoor living renovation. Whether you design and build a brand new outdoor living addition, or refresh your outdoor spaces, there are stunning options available for nearly any budget. At Eby Exteriors, we’re committed to bringing you the outdoor designs and expertise to make your outdoor living dreams a reality. Check out some of our outdoor living designs and highlights to get inspired for both new additions and exciting refreshes. When you’re building your new outdoor living renovation, you have nearly limitless options — so fire up your imagination! Choosing a patio makes for a simple and versatile outdoor space — that won’t require the same level of maintenance as a deck. The two most popular types of hardscapes we install are paver patios and stamped concrete patios. 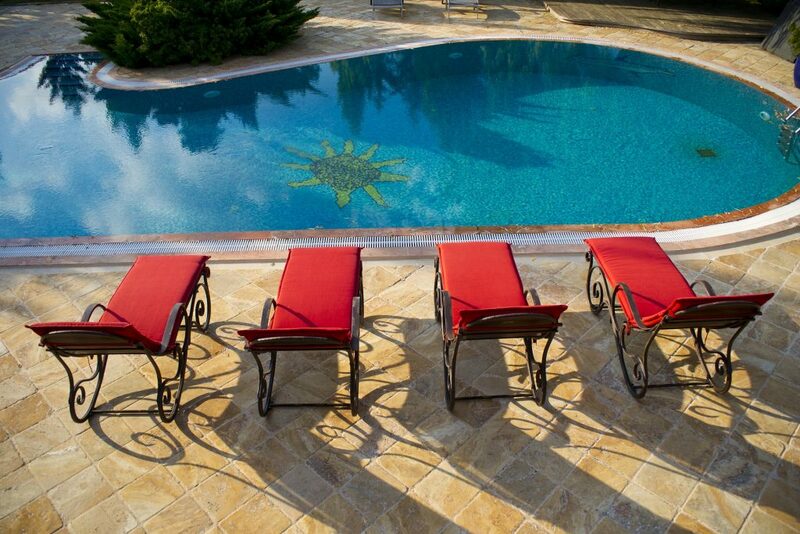 Paver patios are comprised of large paver stones that are arranged to build a distinct design. Pavers create a sandy ornamental look that is completely unique. Another benefit of this hardscape is that pavers look gorgeous as they age, developing a new rustic character. A stamped concrete patio is made by embossing a traditional concrete patio with an attractive pattern. These eye-catching designs can add a new color, finish, or style to your concrete, looking completely one-of-a-kind. While both types of patios can stand up to the elements, a paver patio will age better over decades of use. A common misconception is that decks are more expensive than patios. Not the case. Wooden decks will almost always be less expensive than patios while providing a classic outdoor living area that you and your family will adore. Plus, the 100% natural style of painted lumber creates a truly timeless aesthetic. When it comes to designing new wooden decks, we advise homeowners to build bigger than they think they’ll need. Adding a few extra feet during the original construction phase is relatively inexpensive — however, deciding you need to add-on down the road can be pricey. A spacious deck enhances the luxurious feeling of outdoor living by ensuring that your space is big enough for anything you want to do outside. The perfect mix of indoor and outdoor living, screened or enclosed porches provide you the ambiance of the outdoors with protection from the elements and from bugs. An exciting new outdoor living design features a screened porch attached to an outdoor deck — for homeowners who select it, it’s the best of both worlds. Even if you don’t break ground on a brand on a new addition doesn’t mean you can’t enhance your outdoor decor. We say it because we mean it: outdoor living is for everyone and every budget. Outdoor living renovations from Eby Exteriors transform ordinary spaces from drab to dream. Our designs and ideas enhance the style of a space — while helping you get more use out of it every day.Indulge your imagination with these outdoor living refreshes and re-imaginings! Cover Your Deck — If you have a nice deck, but don’t enjoy it as much as you’d like due to the beating sun, cover it. Turning your deck into a covered porch will create a new visual touch and help you reclaim your backyard. Upgrade Your Porch Screens — Top-of-the-line porch screens can block insects and even create a veil of privacy. With a new screen, you’ll love your porch even more than you did before. Replace Worn Deck Boards — If your deck is still strong but the look has lost its luster, replacement boards can restore its former beauty. Not only will your deck look stunning — but you’ll increase the lifespan, too! Accessorize with a Drink Rail — Perfect for the outdoor living entertainer, a drink rail lines a deck and is the right width for a glass or a bottle. While it’s doesn’t quite make your space an outdoor bar, it is one of the most fun, budget-friendly outdoor living upgrades. New Deck Railing — One of the simplest upgrades that turns an old deck into a showpiece, replacing your worn-out railings with a simple and stylish upgrade can elevate the ambiance of the entire deck. Azek Pavers to Concrete Patios or Walkways — These vinyl pavers fit over existing concrete surfaces, forming a soft and stunning profile. Accessorize Your Porch with a Tongue and Groove Floor — Why have an ordinary porch floor when you could have real mahogany? Tongue and groove floors for porches allow you to improve your porch floor with the luxury material of your choice. Just make sure the floor you choose is approved by its manufacturer for outdoor use. Create an Under-Deck Oasis — If you have an elevated deck, you can transform the ground level space into a secluded sitting area. The main step to accomplishing this is installing a water diversion area underneath your deck, which keeps your new outdoor living space dry and comfortable. Furnishing — The right furniture or fixtures can help you and your guests see your outdoor spaces in a whole new way. Whether you buy new chairs or place a focal-point area rug, sometimes the simplest changes can have a huge impact. Excited about these outdoor living designs? We’d love to help you bring one – or more — to your backyard. Eby Exteriors is the Lancaster County home remodeling contractor that believes in outdoor living for all. 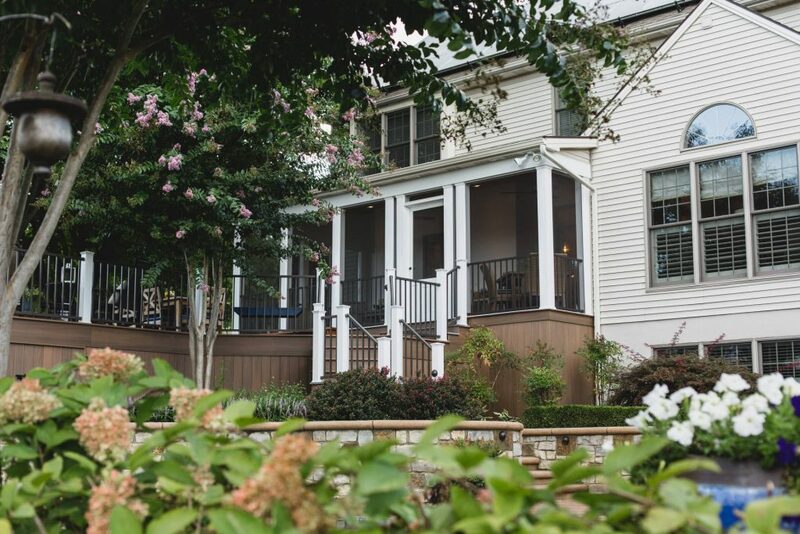 Whether you want to build an expansive new patio, refurbish your deck, or make a stylistic statement with the right accessories, we’d love to help you make your outdoor living dreams become a reality. If we’ve sparked your imagination, start a conversation with us today! If you’re ready to take the first step, contact us for your free quote! 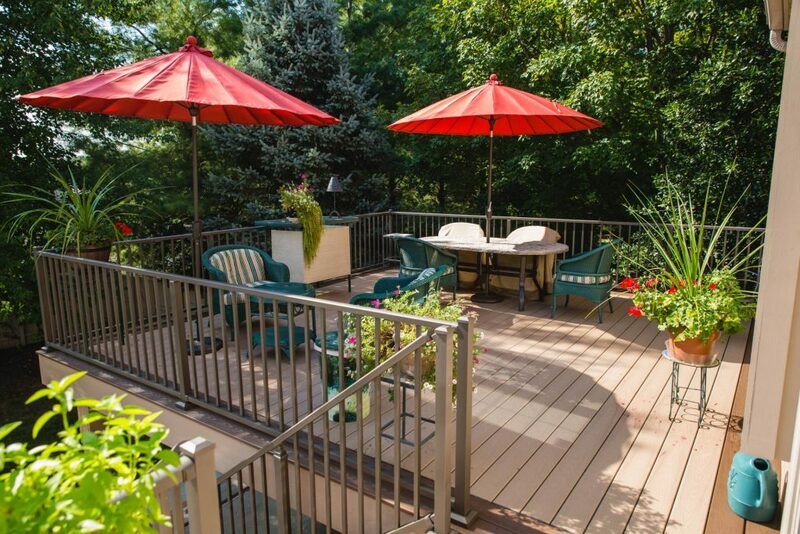 Decks vs Patios: Which is Right for You?